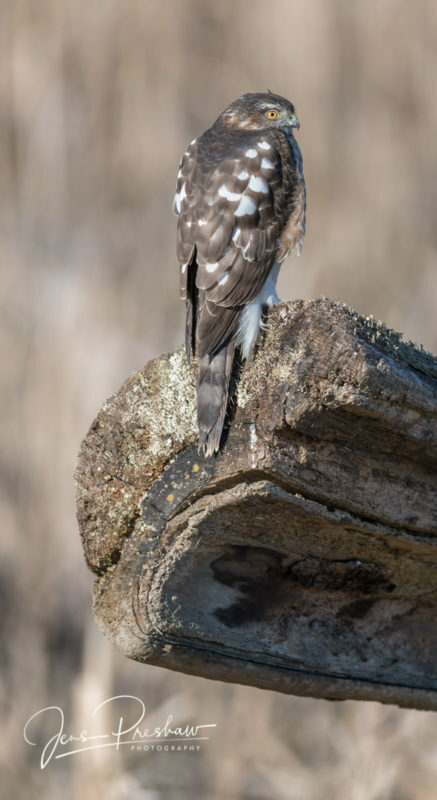 It was a beautiful Spring morning, I was enjoying the sunshine and I guess I wasn’t paying attention to my surroundings, because I almost walked right past this juvenile Cooper’s Hawk ( Accipiter cooperii ) perched on the end of a log. At least, I think it’s a juvenile Cooper’s Hawk, because they’re similar to the Northern Goshawk and the Sharp-shinned Hawk. The Cooper’s Hawk is very agile in pursuing small birds through trees and bushes. I’m happy this young raptor let me spend some time with it.